Less awkward deal hunting ahoy! Barcode scanners have been helping shoppers save money since the dawn of the smartphone era, but getting busted looking for a better deal online by the struggling independent store owner sure is embarrassing. However, help is at hand for guilt-ridden Google Glass Explorers who can now perform on-the-sly price comparisons thanks to the launch of the eBay RedLaser app on Google's high tech headpiece. 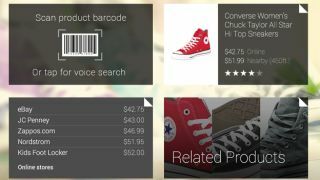 Much like its mobile predecessor, the RedLaser app allows users to use Glass to focus on and scan the barcode in question to bring up local and web-based offers including, of course, eBay listings. If the better deal is a mile across town the app will guide users to the point of sale, but if they wish to buy online, users will need to grab their mobile device in order to complete the purchase. Even more intriguingly, the RedLaser app is also compatible with Google Now voice commands, allowing users to eschew the barcode scanning altogether and simply utter, "Ok Glass, find a product." The app from eBay already has over 30 million users on Windows Phone, iOS and Android, but this is certainly the most 'eye-catching' version yet.